Our range of products include asphalt batch type mixing plant and road construction asphalt plant. 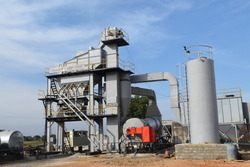 We offer Asphalt Batch Type Mixing Plants to our clients. We are using upgraded technology in a systematic way to produce high quality Asphalt Plants. We offer premium quality Road Construction Asphalt Plant to our clients. The plant has optimum efficiency with min work cycle duration.